The 88th episode of THE FIRE AND WATER PODCAST is now available for your listening pleasure! THE FIRE AND WATER PODCAST is the official podcast of FIRESTORM FAN and THE AQUAMAN SHRINE. We discuss the classic Firestorm backup stories from THE FLASH #289 & 290 (1980), by Gerry Conway and George Perez. Featuring Perez’s very first work for DC Comics! This is the first installment in a new reoccurring feature covering backup stories of our favorite heroes. Plus, the new golden age of Aquaman continues as we cover the 2nd issue of AQUAMAN AND THE OTHERS, by Dan Jurgens, Lan Medina, and Allen Martinez. You can find the 88th episode of THE FIRE AND WATER PODCAST on iTunes. While you’re there, please drop us a review on the iTunes page. Every comment helps! Alternatively, you may download the podcast by right-clicking here, choosing “Save Target/Link As”, and selecting a location on your computer to save the file (27 MB). Here it is, George Perez’s very first page for DC Comics! The splash page for the Firestorm back-up story in The Flash #289! Click to enlarge! Posted in: Firestorm #01: Original (Ronnie/Martin), Flash back-up stories, George Perez, Gerry Conway, Podcast. Another great round of picks for Instock Trades! I’ve been on a Classic Defenders kick lately and have really been enjoying Dr. Strange as the psuedo-leader of that Non-Team, maybe it’s about time I look into his solo book from the era as well! Crap! I haven’t gotten a chance to read Aquaman & the Others #2 yet! And I don’t have these Flash issues either! Damn! I need to get on that ASAP! I really need to track down the Flash series on dvd! I watched it when it was airing, but haven’t seen much of it since! Holey Moley that dialogue between Clark and Bart from that Smallville clip was awful. Clark’s was fine, but who the hell wrote all of Bart’s lines? The same guy who wrote David Caruso’s “tough talking the dead body” one-liners in CSI Miami? Yikes! Shag, don’t spend too much time wondering about Cliff and Doreen’s history, it’s not worth wasting the time or effort. Ideally they’d walk off into the sunset, hand in hand, climb into a Pinto, and drive it off a cliff killing both of them in a horrible painful death. I like Rob’s idea of Firestorm using one of Peter Parker’s cameras, that would have been a hilarious little easter egg if we would have flown out the window and found a camera webbed to a skyscraper! I don’t know why you guys thought there were two Atlans in the prologue of AATO. The old guy clearly says, “Goran…” to his son. I had no idea what was happening with Sky’s Land of the Dead. I thought they were there from page eight. It was only after listening to your discussion that I realized that only Sky went back and forth. So thanks for making that clear. Loved the Firestorm back-ups. I have them in the FS TPB, so I was able to compare the Perez drawn origin summary to the original. Conway actually used some of the same dialogue. That was pretty clever. 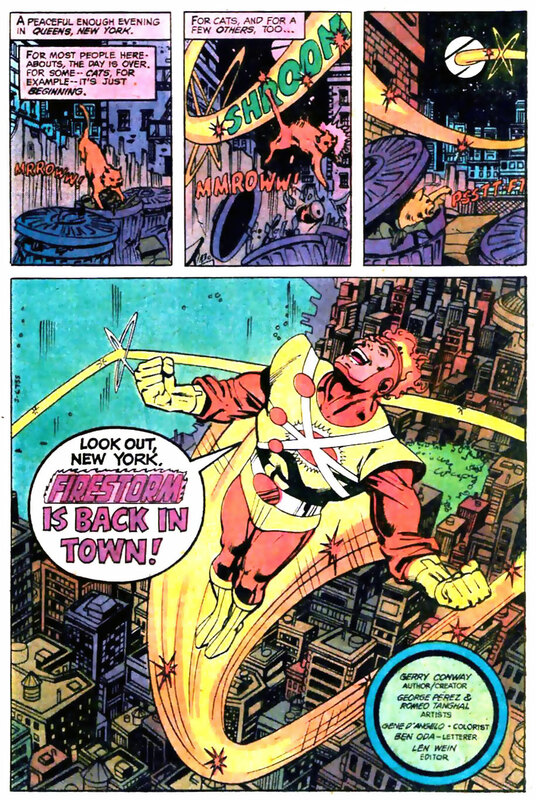 At the end, when Firestorm changes the antenna to a camera, I thought of last issue’s discussion about Firestorm’s ability to re-create a jet plane. I’m sure Ronnie doesn’t know the intricacies of a camera, either, yet here he is making it. So I guess he just “knows” on a sub-conscious level how to “make” things? As for titles…how about “We’ve Got Your Back” or “The Back of The Podcast”? Forgot to mention that the half-splash by Perez in the first re-appearance mirrors the full splash by Milgrom in FIRESTORM #1. I thought that was clever, too. Dr. Strange is the place where writers got to do more sophisticated stories and very fine artists who couldn’t hit the broad side of a deadline were allowed to fail to produce a consistent run of significant length. Strange was always a niche/cult favorite, so his book could get away with a lot more in terms of stylistic flourishes and tone in the Silver and Bronze Ages. Doctor Strange’s fall from favor began in the ’70s, as the sort of unreliable but outstanding talent that used to pop up on his book started turning out prozines and early independent titles instead. Then mini-series and graphic novels came into vogue, especially the non-code stuff, so it made more sense to be artistes there than on a comparatively mainstream and not especially lucrative Dr. Strange title. Roy Thomas also camped out on the book in the waning days of his career, so that by the ’90s the Master of the Mystic Arts was as hoary as his inspiration Mandrake the Magician was in the ’60s. There have been many unfortunate attempts to make the Sorcerer Supreme “hip” again, which only accumulates into a long patch of tired. I think Strange has less in common with Aquaman than Iron Man and Hal Jordan, two guys that were too grown up and unsympathetic for most comic fans who eventually came into their own by embracing what made them stand apart. Stephen Strange, if cast and produced correctly, could replace Robert Downey Jr. as the breakout star of the cinematic universe. Very strong origin and distinctive features that mine glorious veins of potential– the Marvelized Harry Potter meets House. The truth is, I’m simply not as interested in Miller’s first run on Daredevil as what followed. A lot of it seems silly and dated now, especially once the Teenage Mutant Ninja Turtles took off on the more cliché elements of Miller. Gotham on FOX looks SO much better than anything the CW has ever produced with DC’s characters. I can’t wait to not watch it! I have pretty much no interest in anything Batman related anymore, especially an extended prequel series. Kudos to the producers for doing such a fine job on a series that isn’t for me. George Pérez is obviously one of the greatest comic book artists of all time, but I don’t feel him on Firestorm. Gorgeous George was an odd fit on his few Spider-Man outings, and the Nuclear Man has a similar enough vibe to also seem off to me. Serious, moody and realistic in a way that doesn’t click with a guy like ol’ Match Head. Looking forward to Starlin, though. I read the Firestorm backups back in the day and more recently in the trade of the original series. That is some very good Perez art. And I was thrilled to see the ‘Prof Stein has no memories’ plotline go away. Of all those backups, the one I liked best was ‘Whatever happened to…’ in DCCP. Before Who’s Who, that series was what introduced me to some of the little known characters if the DCU. As for a name, how about ‘Back-up Files’. After all, you should always back up your files. A pity they didn’t put Firestorm in Adventure and Aquaman in Flash (which is just about the only switch that could have been made in the backup lineup); I was buying Adventure for the Starman stories mainly and viewing Plastic Man as a bonus and the new Aquaman stories did nothing for me at the time. Shag— Regarding Cliff walking away with Doreen arm in arm in the Flash backup, the way I interpreted it is that this is the way Ronnie remembered it. Not that it was accurate, but that the whole thing is from Ronnie’s POV. So Ronnie was insecure and jealous of Cliff, and *Ronnie* was perceiving Doreen as Cliff’s girl, and remembered it as his epic failure to secure Doreen’s affections from Cliff. So in his mind, he remembers Doreen walking away with Cliff affectionately, where in “real life” she probably just walked away with Cliff simultaneously and coincidentally. Eddie Earhart never appeared again. “The Flash” was indeed a wonderful show. The Trickster movie Rob had mentioned was also released in Asia on VHS as “Flash II: Revenge of the Trickster” — with “Flash I” being the pilot episode. Also released on VHS was “Flash 3: Deadly Nightshade” — which featured the two Nightshade episodes. Living in Hong Kong and Malaysia in the early 1990s, these three PAL tapes comprised my entire collection of “The Flash” show until the entire series DVD was released in the mid-naughties. While some aspects of the show are now charmingly dated, the series as a whole still holds up well in my mind. All I could think of was the annoying “beep-beep-beep” trucks make when they back up…so…I’ll second Xum’s “Call for Back-up”…I think its pretty clever! So essentially Eddie Earhart was like Carradine (the burglar who murdered Ben Parker) in Spider-Man — someone who played a major role in the hero’s creation but only reappears in flashbacks. I do recall Carradine returned in a Spider Man comic in the 90s… and promptly died.